All dentists go to dental school before they can practice, but it’s not the biggest concern you should have when it comes to their education and training. Dentists also need to be continuing their education by completing many hours of additional schooling. It doesn’t matter if you’re speaking to them on the phone or in person, ask them if they’ve made continuing education a commitment. 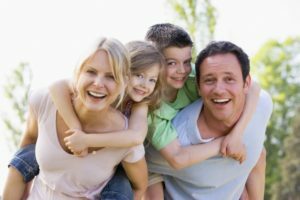 Like all other medical fields, dentistry is constantly changing and developing, so you don’t want your dentist to be lagging behind on techniques that could favor your family. When picking a family dentist, they should be capable of treating patients of all ages. Some dentists choose specialties that don’t involve working with many younger or older patients very often, for example. Ask them how often they see families and if you can rely on them to provide care for all of your family members, whether they be eight years old or 80. At the end of the day, it’s about determining what your family’s individual needs are, especially if you have multiple young ones with developing mouths. If you believe your children are going to need orthodontic services to fix crooked teeth, this should be a high priority. If your older family members are going to need denture replacements or dental implants, confirm that these services are readily available. Dental practices are increasingly expanding their online presence, so if someone recommends a practice or you find a practice’s website, take a moment to see what their reviews look like. Many of these reviews, whether they be on Facebook or Google, offer detailed insight on what you can expect. The more reviews they have, the more accurate of a picture you can learn. No matter how promising a practice looks online or sounds over the phone, nothing beats visiting the practice in person. During your tour, you’ll be able to gain a more accurate depiction of how the practice runs. Take note of how long patients wait before they are seen. See if the dentist can come out and talk to you. Ask them any questions you may have, such as what technology they offer. Does office feel like it accommodates for children? Keeping these points in mind will make a big difference. Before you schedule your next appointment, make sure to consider them! Dr. Gary Henkel has been providing dental care to people of all ages and backgrounds since 1981. He has years of experience treating patients who are physically and mentally challenged, as well as medically compromised. To learn more about his practice or learn if he’s the right family dentist for you, feel free to contact him through his website.